This is a beautiful and delicious Greek salad recipe. If you’ve never tried Israeli couscous before, it’s a bit like a small round and chewy pasta (it cooks just like pasta, if fact). If you can’t find Israeli couscous, you can substitute regular couscous (you can use the same 1 1/2 cups of regular couscous, but steam it by adding it to 3 cups boiled water, turn off the heat, cover, and let sit until all the water is absorbed). 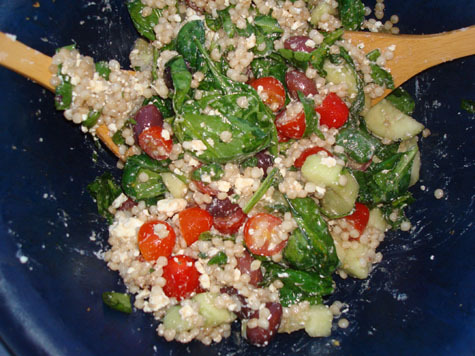 And if you avoid wheat/gluten, you can try this salad with cooked quinoa or millet instead. 1. Bring a pot of water to boil. Add a pinch of salt and the couscous. Reduce heat slightly and cook couscous in the water for 6-8 minutes until tender. Drain and set aside. 2. Mix all salad ingredients in a large bowl. Add cooked couscous, oil, vinegar and lemon juice and mix well. Crumble feta cheese over the salad and mix again. Taste and add salt and pepper and/or additional dressing to taste, if desired. Serves 8 as an appetizer. If you'd like this to be a main course, some chickpeas or sliced grilled chicken mixed in would be great.